For over three years, we have helped customers find devices that work with Azure IoT technology through the Azure Certified for IoT program and the Azure IoT device catalog. In that time, our ecosystem has grown to one of the largest in the industry with more than 1,000 devices and starter kits from over 250 partners. 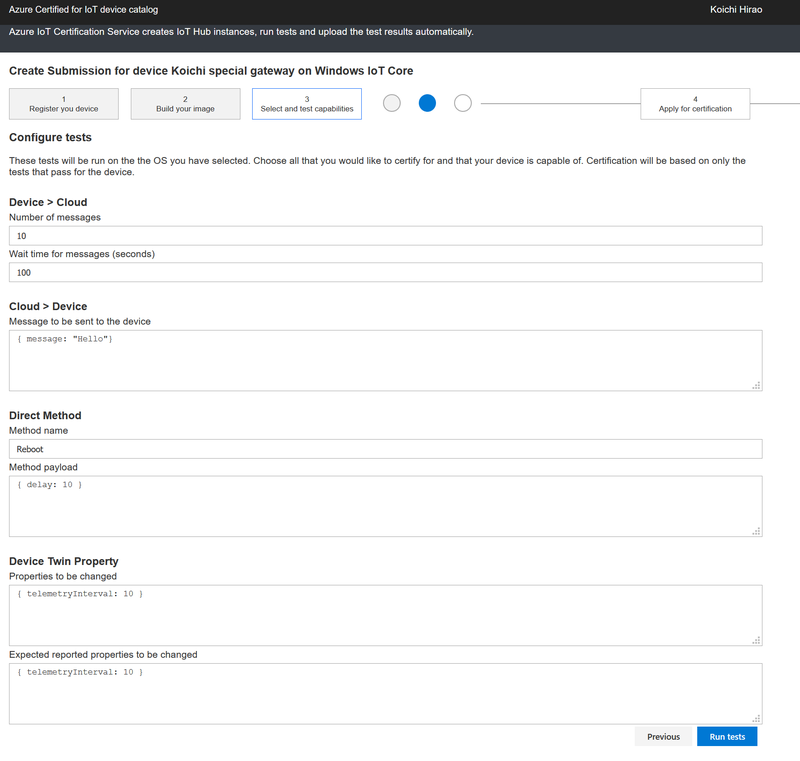 Today, we are taking steps to further to grow our device partner ecosystem with the release of Azure IoT certification service (AICS), a new web-based test automation workflow, which is now generally available. AICS will significantly reduce the operational processes and engineering costs for hardware manufacturers to get their devices certified for Azure Certified for IoT program and be showcased on the Azure IoT device catalog. Over the past year, we’ve made significant improvements to the program such as improving the discovery of certified devices in the Azure Certified for IoT device catalog and expanding the program to support Azure IoT Edge devices. The goal of our certification program is simple – to showcase the right set of IoT devices for our customers’ industry specific vertical solutions and simplify IoT device development. AICS is a web-based test automation workflow that can work on any operating systems and web browser. 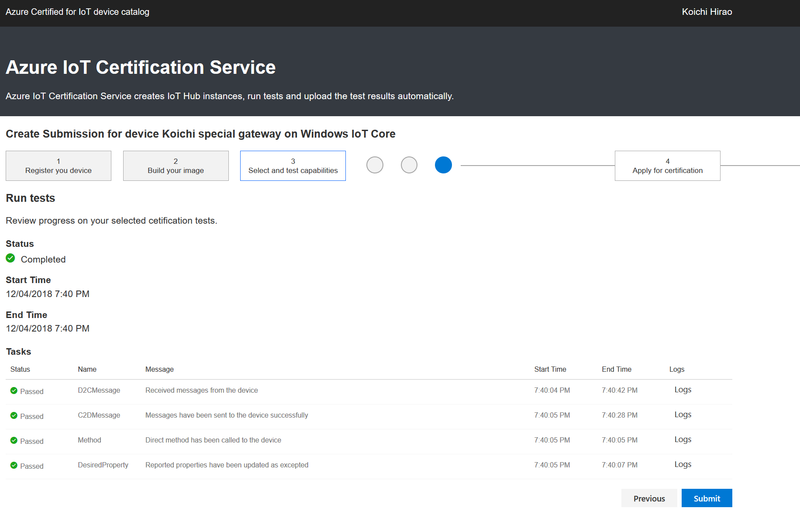 AICS communicates with its own set of Azure IoT Hub instances to automatically validate against devices to Azure IoT Hub bi-directional connectivity and other IoT Hub primitives. Previously, hardware manufacturers had to instantiate their own IoT Hub using their Azure subscription in order to get certified. AICS not only eliminates Azure subscription costs for our hardware manufacturers, but also streamlines the certification processes through automation. These changes accrue to driving more quality and consistency compared to the manual processes that were in place before. The certification program for IoT devices has always validated against bi-directional connectivity from device to IoT Hub cloud service (namely device-to-cloud and cloud-to-device). As IoT devices become more intelligent to support more capabilities, we have now expanded our program to support validation of device twins and direct methods IoT Hub primitives. AICS validate these capabilities and Azure IoT device catalog will correspondingly showcased them as well that make it easy for device seekers to build IoT solutions on these rich capabilities. The screenshot below shows customizable test cases. By default, device-to-cloud is the required test and all others are optional. This new requirement allows constrained devices such as microcontrollers to be certified. The screenshot below shows how tested capabilities are shown on the device description page in the device catalog. 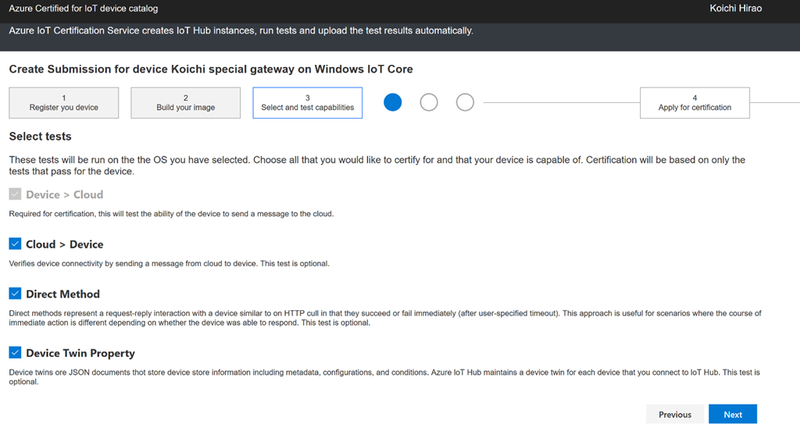 Previously, hardware manufacturers were required to use the Azure IoT device SDK to build an app to establish connectivity from device(s) to cloud managed by Azure IoT Hub services. Based on partners’ feedback, we now support devices that do not use Azure IoT device SDK to establish connectivity to Azure IoT Hub, for example, devices that use the IoT Hub resource provider REST API to create and manage Azure Hub programmatically or hardware manufacturers opt to use other device SDK equivalent to establish connectivity. In addition, AICS allows hardware manufacturers to configure the necessary parameters for customized test cases such as number of messages of telemetry data sent from the devices. The screenshot below illustrates an example page that shows the ability to configure each test case. Finally, we have made investments to design a user experience that is simple and intuitive to hardware manufacturers. For example, in the device catalog, we have streamlined the process from device registration to running the validations using AICS through a simple wizard driven flow. Hardware developers can easily troubleshoot failed tests through detailed logs that improves diagnose-ability. Because it’s a web-based workflow, serviceability of AICS is so simple that hardware manufacturers are not required to deploy any standalone test kits (no .exe, .msi, etc.) locally on their devices, which tend to become outdated over time. The screenshot below shows each test case run. Log files show the test pass/fail along with raw data sent from device to cloud. The submit button only shows up when all the test cases selected pass. Once the tests are complete, we will review the results and notify the submitter of additional steps to complete the entire certification process. Effective immediately, all new incoming submissions for certification must be validated via AICS. We also highly recommend that existing certified IoT devices re-certify using AICS because doing so allows us to showcase your additional hardware capabilities. You can learn more about AICS in this demo video. If you have any questions, please contact Azure Certified for IoT iotcert@microsoft.com.